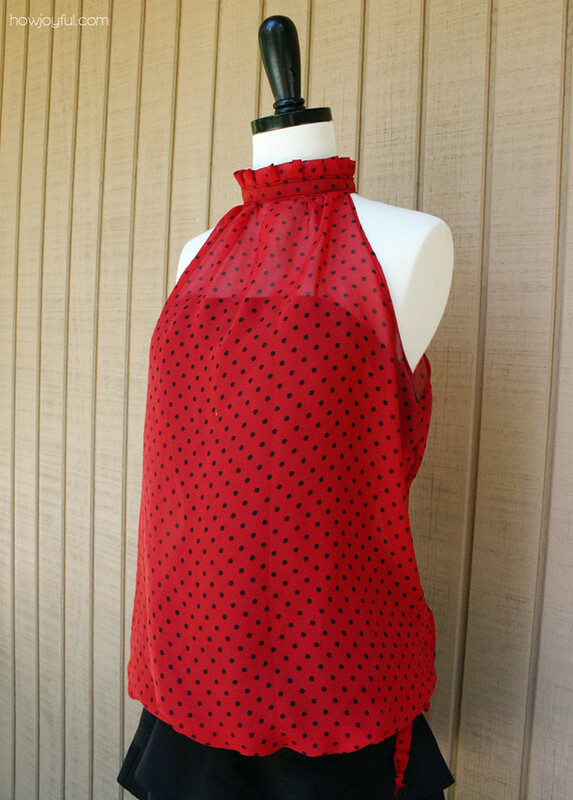 For the top I used some left overs I had of red polka-dot Chiffon, and I wear the top with something under it because the fabric is see trough, but you can make it with your choice of fabric, so you can wear it alone. I used thin satin black ribbon for the button holder and a black button. Top Front: The width for this piece is your bust, I added to my measurement 1 inch on each side for the folding, plus 1.5 inches on each side for comfort. So you need to add 5 inches to your bust to get the width. For the length I measure from the center top of my shoulders to my hips, adding 2.5 inches for the bottom fold. The width of the neck is my measurement from shoulder to shoulder, because I wanted some folds in the front, and I lower the cut in the neck about 1.5 inches. Top Back: The Back Is basically the same piece, but without the lowering of the neck and with a cut in the center. Stripe for the bottom: You can make this piece, or you can use elastic in the bottom for the bubble effect. However length you want by 1.5 inches wide. 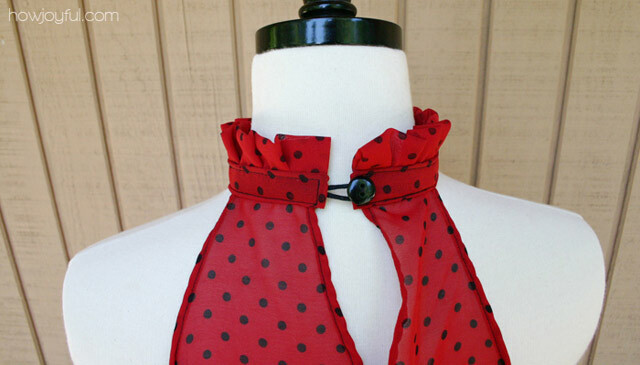 Neck stripe front: Measure around your neck and add 2 inches for the folds, mine is 1.5 inches wide. Neck Stripe back: Same as front piece. 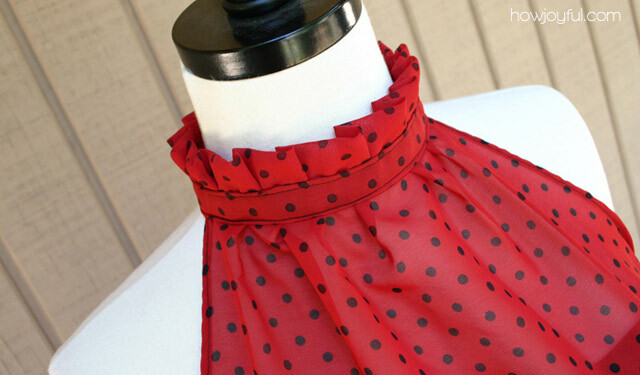 Neck Ruffles:the length depends on how ruffly you want the neck, I did twice the measurement of the neck Stripe front and back for mine, by 3 inch wide. 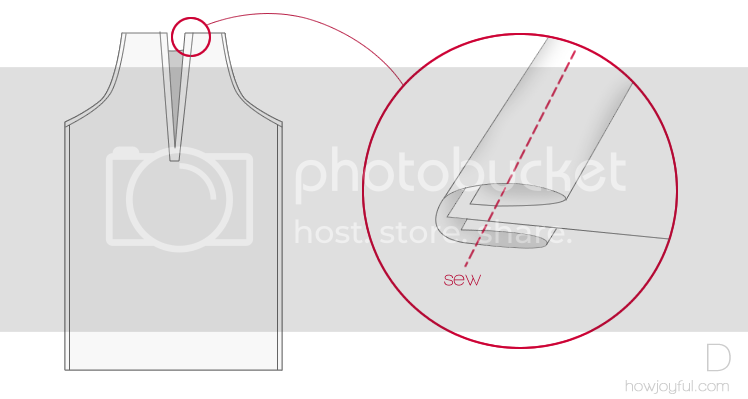 NOTE: Since my fabric is see trough, I folded all the edges and sew them, so it would look better than just sewing and securing the edge with a zig-zag stitch, but this is just my choice, you can do it differently, according to your fabric. B- First you need to sew the pieces 1 and 2 together. 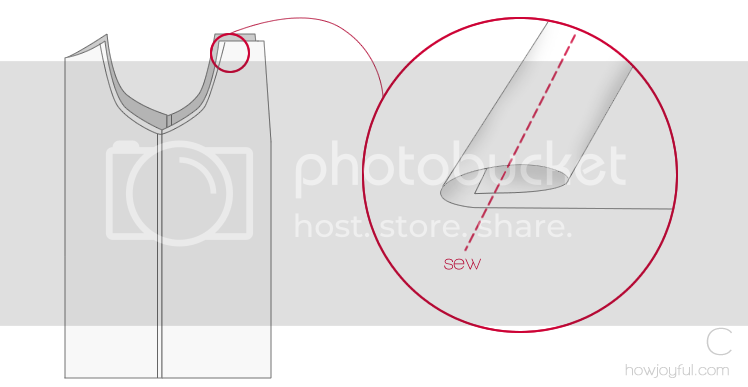 fold the sides carefully and pin, once you finish sew trough the center of the fold, my fold is 2/8 of an inch. Remember that you are folding 3 times, that's why we left 1 inch on each side to sew. 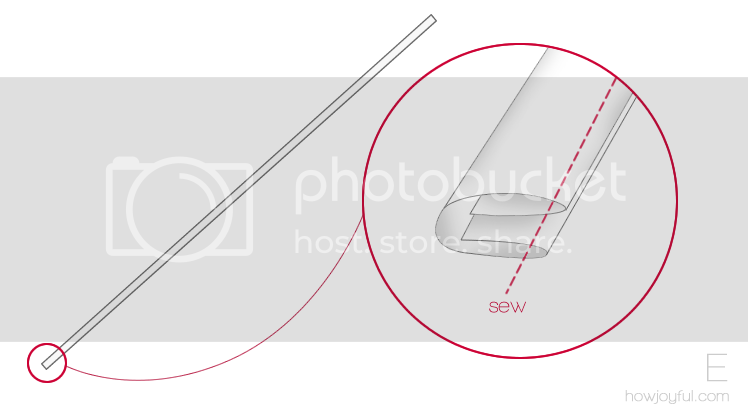 C- Now if you look at your tube from the side (Like in the graphic) you will need to fold again, but now just the edges of the shoulder area, all the way around, my fold is 1/8 of an inch wide. D- In this graphic we are looking at it from the back again, for this fold, I just folded and sew it. but In the graphic I am showing the alternative of using a handmade bias tape, with a stripe of fabric. E- As I stated above, you can either go this piece or simply use elastic, if you do just remember to make this piece long enough to go around your hips and tie on the side. F- fold the bottom piece and sew, my fold is 1 inch. That's why we left the body pieces 2.5 inches longer. I like to make 2 button holes on the side before folding so that way I can pull the stripe trough the holes and have a clean finish. G- Fold piece 6 Neck Ruffles in half, sew with the longest stitch you machine allows and then pull on the top tread. Even it up until your ruffles piece is the same length as piece 4 and 5. H- Make a sandwich with piece 4 in the bottom, piece 6 in the center and piece 5 in the top, all the right sides of the fabric have to be facing inside. Sew on the edge of the side you made the ruffles. 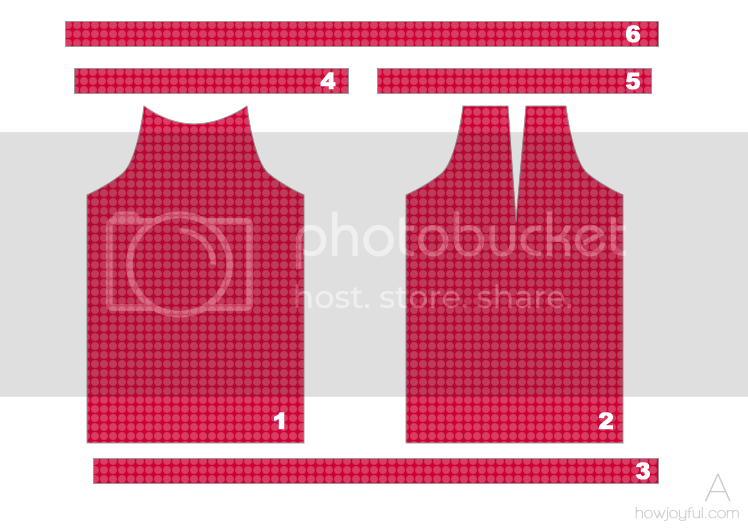 I- Turn the pieces so the ruffles are in top, fold the edges of piece 4 and 5 to the inside like the graphic. 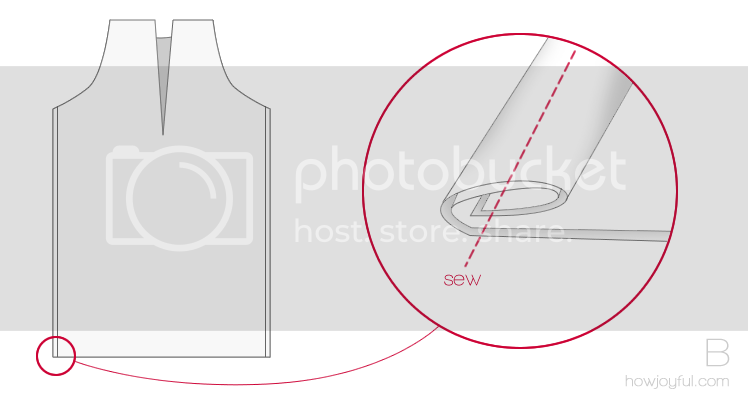 J – Add the ribbon for your button holder and fold all the edges to the inside, so they are all clean, pin when required. Add the body part to the center of the fold, measure your pieces to make sure everything is centered, for the font gather your fabric to get the wrinkle effect. Once your satisfy with the position, sew. K- Add the button on the back, and you are ready! 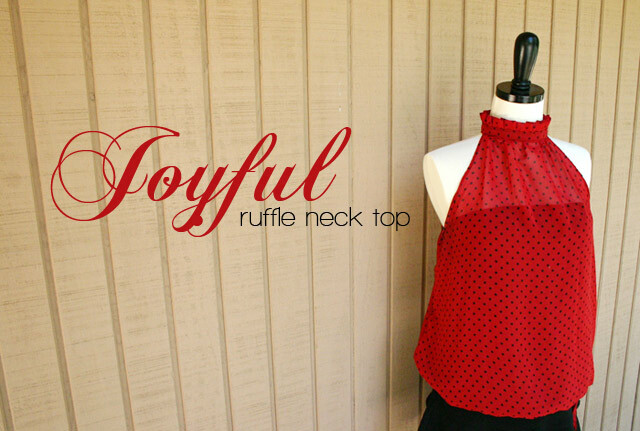 I love this top, is so comfortable and the ruffles make me feel very girly :) Let me know if you make it I will love to see, Happy Sewing! I wish I could sew! I would definitely make this! I’m definitely going to make this – thanks so much for posting it! Chiffon is very hard to cut just because it moves a lot, I pin the fabric to my newspaper mold before cutting just so it stays in place. Let me know if you have more questions! I would to see your top once its done! Thank God!! Finally, F.I.N.A.L.L.Y, a tutorial so simple and so well done! I’m italian and it’s no easy for me understand every single word, and photos are not very exaustive!! Thank you a lot!! Now i’m getting to looking for every single tutorial you made! This is gorgeous and so easy to follow! I saw a top like this the other day and wondered how I was going to get the fabric to behave long enough to make it look like that. Now I know! very nice job…ill made it soon …thanks for sharing!! !kisses from Athens Greece!!! Hi there – I love this! i made this BEAUTIFUL top!!! thanks!!! Thank you for posting this tutorial. I’m planning to make one for my 4-year old. :) This tutorial is just fantastic – so detailed and easy to understand. This is so far THE BEST tutorial ive ever come across… B-E-A-UTIFUL!!!! thianks soo much!!! 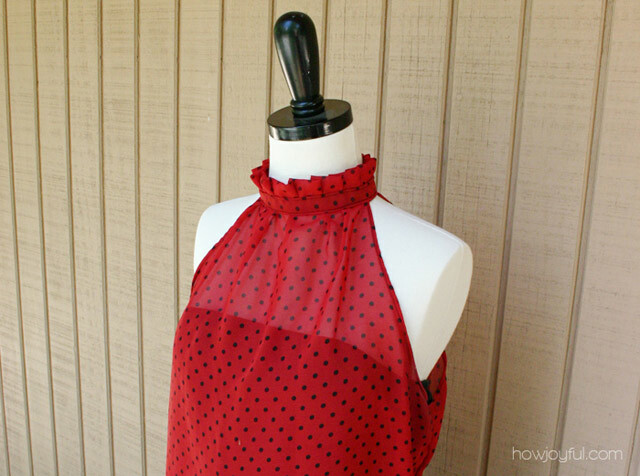 This is a great tutorial and a lovely top. I linked to it on my blog today…I hope that’s ok! love this top its soo cute and it gives a chick ok to .well going to tey this now ,one more problem can i swe this top using satin? Can i get this on spanish???? please…..
Super cool! This design and all your tutorials! Thanks!! Hi my name is Bailey i am 13 and i love to sew. I tried out your teddy bear pattern and it turned out great im going to give it to my cousins new baby. Also i was kinda surprised at how big it turned out but it looks great. Hi – this tutorial is really great! 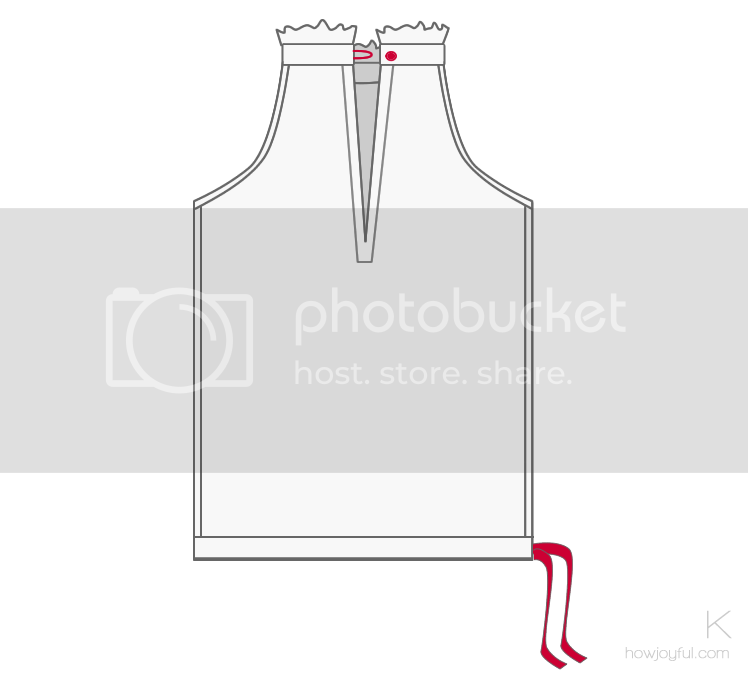 !…..Such details and the measurements instructions are really helpful. Making this today for my little sis and my daughter….Thanks a ton!!! Please post some more. How do you print pattern pieces?